Roll out 175g shortcrust pastry and line 4x10cm loose-bottomed tart tins. Place on a baking sheet and bake blind for 15 minutes in a preheated oven 180ºC, gas mark 4. Meanwhile, remove the skin and bones from one Arbroath smokie and flake the flesh roughly. Divide the flaked fish between the tart cases. Whisk together 2 eggs (medium), 1x200ml carton crème fraîche, 1tbsp horseradish sauce and freshly ground black pepper. Pour over the fish. 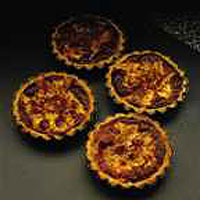 Reduce the oven temperature to 170°C, gas mark 3 and bake the tarts for 15 minutes or until set and lightly brown. Sprinkle with a little cayenne pepper and serve warm, with dressed salad leaves. This recipe was first published in October 1998.